Your face is almost always the first thing people notice. Faces can be mesmerizing, and captivating. Having a well defined face can make you feel more confident. You just need to know how to achieve this goal. Making your face more defined takes a little work. You may need to play up your makeup. Some toning exercises can build muscles and create a firmer appearance. In addition, adding and removing foods from your diet can make all the difference in how your face stands out. This article will give you tips on slimming down the look of your face without diet pills, extreme dieting, or surgery. Read further for some easy ideas you can do right at home. The first step in making your face look thinner is to actually take a good look at your face. Quick glances during the day aren’t enough to know the areas that need work. You need to asses the shape of your face, your jaw structures, and problem areas you want to work on. Stand in front of a mirror in a well-lit room. Take a good look at your facial structure. Turn your head side-to-side. Is there a double chin? Are your eyes beginning to droop? Are your eyes puffy? After you assess your face, you can pick and choose which of the following tips will help you the most in the areas you want to work on. Note: Keep in mind that if you are experiencing new puffiness in your eyes, or facial swelling you may need to check with your doctor. Eye puffiness and facial swelling can be a sign of certain health conditions. Most often, an unhealthy diet will show up in your face first. In addition to looking heavier, your skin may lose its healthy glow. Eating the proper nutrients that your body needs will lessen fat deposits everywhere on your body. Sugar is stored as fat to burn later for energy. Cut white sugar and processed carbs, and add in fruits and vegetables to replace it. Increase fluid intake to flush out fat and toxins, and make sure you are staying within the calorie range for your height and weight. Buy some sugar-free gum and chew a few times a day. This can work most of the facial muscles to help tone them, and burn off facial fat. If you can, try sugar-free bubble gum and add in some fun bubble blowing to work even more facial muscles. These are “hugs and kisses” for your face. If you say “X” and “O” notice how it contracts your facial muscles to move in and out. Make a smiley face when you say the “X” and a form your lips into an “O” when you do the exercise for most effectiveness. You can also just open your mouth into a large “O” shape, hold it, and then release. Repeat this 15 to 30 times. Yoga is an excellent type of exercise that improves muscle tone, increases blood flow and oxygen to your tissues, and can burn fat. There are yoga poses that can do all this for your face and help it look thinner. Any of the yoga poses that encourage things like; head down, neck extensions, straight posture, and even breathing can help improve the tone of your face. If you slump when you sit or stand, you may fold over fat tissue in your neck and chin. This leads to a “double chin” appearance. Make sure you keep your neck straight in alignment with your spine, just over your shoulders. You can also pick your chin up slightly to eliminate the double chin. When you take deeper breaths, your chest opens up and your back straightens. This brings your face up and fat tends to even out or even disappear. It can also bring more oxygen and nutrients to your facial areas, improving look and tone. How to make your face thinner? While you are working on losing facial fat, you can use facial contouring to help reshape your appearance. Use a good contouring powder and brush along your cheekbones, jawlines, and sides of your nose to add depth to your look. You can draw the eyes downward from the face by wearing clothes with vertical stripes and long necklaces. Try wearing darker colors on the bottom, and patterned tops. It also helps to avoid earrings that dangle, and switch to dainty studs. You can also pluck your eyebrows into a nice arch. Keep some thickness in the inner eye area, and thin them towards the outer eye. You can also put darker eye shadow in the creases to help draw them up. Make sure you use an eyebrow pencil to define them after plucking. Dark circles under your eyes and age spots can add the appearance of extra weight to your face. 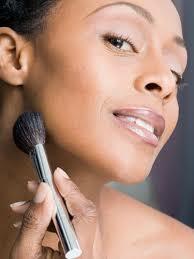 Use a concealer that is just a shade lighter than your skin tone to even things out. Then cover with your usual shade of cover-up and a dusting of powder. Pull your hair back into a bun or ponytail. Bringing your hair up off your face will help give it more definition and play up your features. Make sure you wear your ponytail about the same height as your cheekbones for the best result. Color your hair a darker shade and add some highlights. Keep the hairs around your face dark, and highlight the crown and back. This will give the face more definition and draw the eyes up away from the face. How to make your face thinner? While it takes constant practice and diet changes to actually achieve a thinner look, you can try the above tips for temporary more defined look.